Farmers’ markets are gaining popularity and becoming increasingly recognized as essential focalpoints for local food systems in the United States. However, many low-income communities do not have the opportunity to fully participate in this growing trend. This is particularly problematic when considering that many people in impoverished communities face hardships regarding access to fresh nutrient-rich foods. Food stamps, now known as SNAP (Supplemental Nutritional Assistance Program) have transitioned into the paperless EBT (Electronic Benefits Transfer) debit card system. With this transition, farmers’ markets have had to adopt a new system in order to accept EBT (food stamps). The Amherst Farmers’ Market, which is an extremely diverse and well-established market open from April to November, has not yet made the transition. Consumers, farmers, and market managers must accommodate the steps necessary to implement and sustain a successful EBT system. These models must be customized to meet the needs of each market. 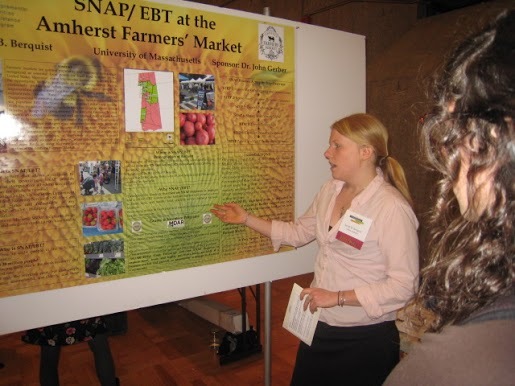 This study will examine the demographics of the town of Amherst, research protocols, study successful examples, make community connections, and raise funds in order to create and maintain a successful EBT system at the Amherst Farmers’ Market. is based on the use of fossil fuels which is extremely costly, not only monetarily but also ecologically. These methods result in harmful outcomes such as declines in soil health and negative impacts on water quality due to fertilizer runoff. For every calorie of food that is produced, 10 calories of fossil fuel are consumed. One promising alternative to this detrimental process of producing sustenance is the forest garden model. A forest garden is an approach to designing agricultural systems that are modeled after the relationships found in natural ecosystems. By mimicking these principals, the system maximizes output while minimizing input. This method of farming is significant in that it is economically and ecologically sustainable. Not only is it a viable form of production in a wide range of climates, but it also has potential to improve the overall health of an ecosystem. With declining health of global ecosystems, an increase in forest garden awareness and education will promote a shift from conventional forms of farming to more sustainable systems. Not only can this model of farming be used to produce food, but also medicine, fibers, building materials, fuel, and other useful products. 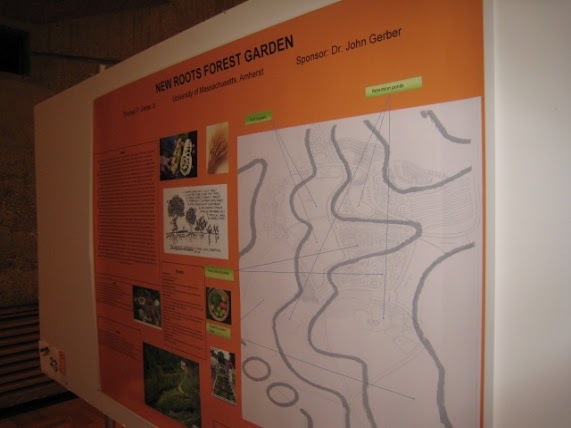 This project will demonstrate how to turn a relatively unproductive area residing between forest and farmland into a beautiful and productive forest garden. for the care of the birds as well as all decisions regarding the flock. Weekly responsibilities of thegroup will include regular meetings and scheduled chore dates. 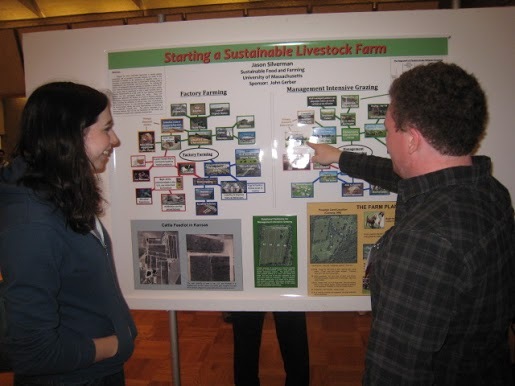 Collaboration between the AnimalScience Department, motivated student leaders, and the UMass Hadley Livestock Center will provide the necessary resources to maintain a flock of meat birds for educational purposes. The project will be an integral part of the livestock program at UMass, educating students about chicken production and the benefits of local farming. 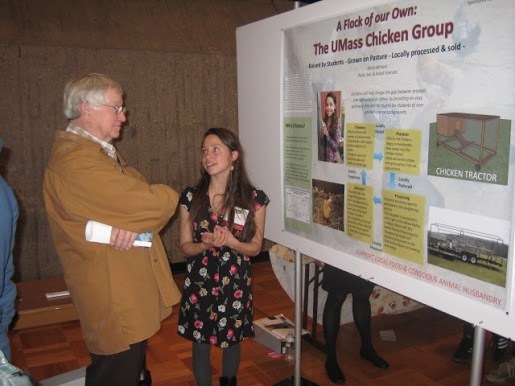 The UMass Chicken Group will reconnect students with poultry while facilitating an enhanced understanding of the symbiotic relationship between livestock and agriculture. Over the past several decades, land-use policies and economic trends associated with deindustrialization created an abundance of vacant polluted sites in U.S. cities. These sites, referred to as “brownfields,” tend to be located in lower-income neighborhoods and both indicate and perpetuate economic disenfranchisement. The forces that lead to the creation of brownfields also give rise to food insecurity. The common model of brownfield reclamation only addresses economic revitalization; however, sustainable models of community growth and redevelopment must integrate food access and brownfield remediation. This project proposes an alternative development process which, through the introduction of community gardens, turns brownfields into sites that simultaneously bolster the local economy and address issues of food insecurity. 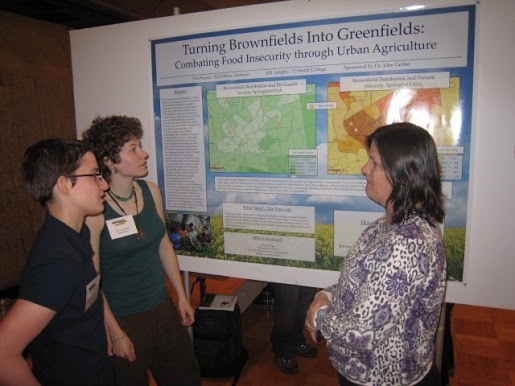 Collaboration between Springfield organizations and Five College students during fall 2010 produced a preliminary guide facilitating the transition of brownfields into sites for food production. This document addresses land access, remediation, and eventual use of sites as community gardens. This project will, through the continuation and elaboration of the guide, further create connections between Springfield and the Five Colleges that will catalyze the conversion of brownfields into sites for community empowerment. and pork production. Within two years, enough food will be grown to sustain the restaurant entirely from the farm. This project will serve as a model for the development of an organic ‘farm to table’ restaurant in Amherst, Massachusetts. 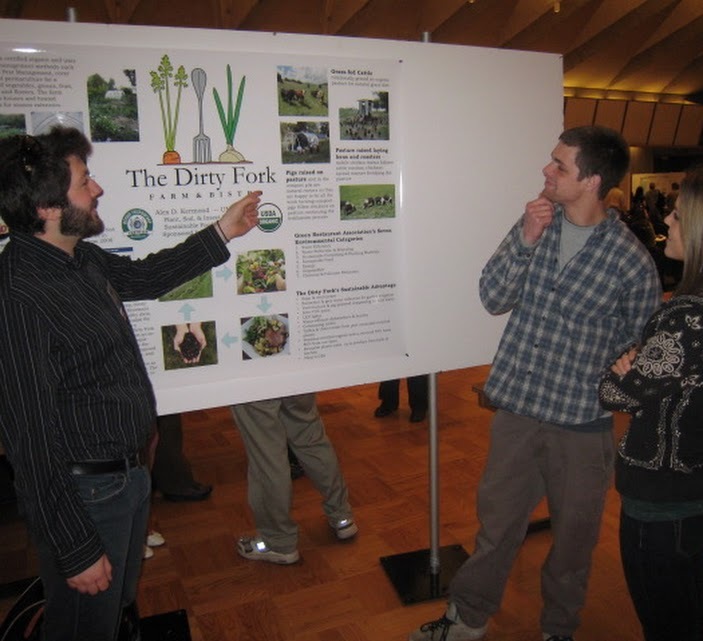 The Dirty Fork will offer a solution to those who want to enjoy going out to eat while supporting a healthy, organic diet. 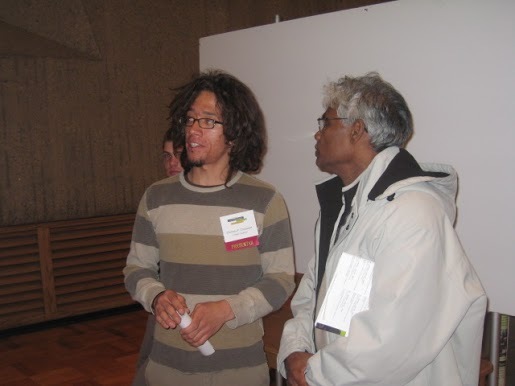 a case study for how aspiring sustainable farmers can turn agricultural dreams into reality. Many new agricultural operations fail because of a lack of financial planning. Developing a business plan clarifies the variables involved in starting a farm, including the estimation of start-up costs, costs of production, and prospective income. It is also essential to balance economics with the environmental, ethical, and social responsibilities of operating a truly sustainable livestock farm. This project culminates in a business plan that will allow for the start-up and thorough development of a small-scale sustainable livestock farm. and classes are emerging in cities around the world, to help people learn to become more self-sufficient. 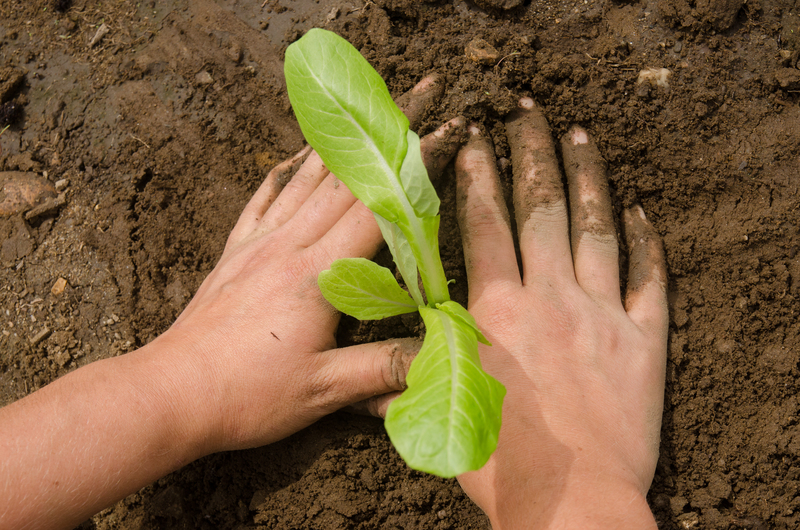 This project will develop an urban community garden in Worcester, Massachusetts, while also including programs and seminars to teach the community about sustainable food production and sustainable living practices. The site is an intercropped fruit, vegetable, and herb garden, with separate garden beds for rent to community members. The focus will be on the benefits of community gardens, community garden development, sustainable living practices, and urban permaculture gardening. Information gathered from other community garden programs like “UGROW” (Urban Garden Resource of Worcester) and “ACGA” (American Community Garden Association) will be used to build community involvement. The goals of this project are to educate people about sustainability, while building community and providing better access to fresh food, and land to grow fresh food on.